On the anniversary of the September 11th attacks, U.S. 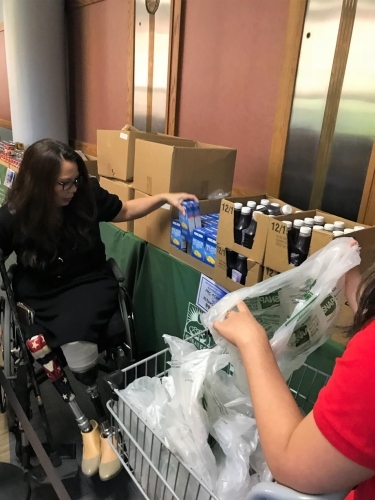 Senator Tammy Duckworth (D-IL) today participated in a day of service by volunteering at the Jesse Brown Veterans Affairs (VA) Medical Center Food Pantry, where she packed groceries to distribute to Veterans in need. Duckworth also met with AmeriCorps members to discuss the importance of community service. During the roundtable, the Senator announced her plans to reintroduce the 21st Century American Service Act in the coming weeks, which would increase service positions available through civilian national service organizations and ensure all young Americans are informed of the opportunities available to them. Duckworth first introduced the 21st Century American Service Act in the House of Representatives with U.S. Reps. John Lewis (GA-5) and Seth Moulton (MA-6) in 2016. The Senator remains committed to working to expand service opportunities for young Americans across the country in the Senate. The food pantries at the Jesse Brown VA Medical Center and Edward Hines, Jr. VA Hospital are a collaboration between the U.S. Department of Veterans Affairs, AmeriCorps and the Food Depository. Each month they distribute fresh produce, meat, and nonperishable food items to approximately 2,500 veterans. Throughout her personal and professional life, Duckworth has also been a strong advocate for the expansion of national service opportunities for all Americans. Duckworth served in the Reserve Forces for 23 years and continued to serve her fellow Veterans as Director of the Illinois Department of Veterans Affairs and then as Assistant Secretary of the U.S. Department of Veterans Affairs. She has also made a point of volunteering with community partners at local schools, food pantries and community centers.